Capacity for large scale electromagnetic analysis enabled in Wave3D suite by broadband MLFMA allows for accurate modelling of large phased antenna arrays. On this page two examples of phased antenna arrays are presented. Fig. 1a: Stand alone 274-element antenna array model (left) designed for mounting on F16 fighter (right). Visualization capabilities of Wave3D’s ParaViz module provide powerful tools for plotting of currents on the array elements and overall antenna, near field on plane, spherical and cylindrical slices and volumes, as well as 3D depiction of the antenna array radiation pattern. Fig. 1b: Magnitude of current distribution on the 274-element antenna array (left), it’s individual elements (center), and magnitude of near E-field in a plane slice (right). Fig. 1c: Radiation pattern of the 274-element phased antenna array under equiphase excitation. MLFMA acceleration the Method of Moment solution in Wave3D enables analysis of large printed antenna arrays on finite substrates as the one shown in Fig. 2a below. Fig. 2a Model of corporate-fed microstrip antenna array featuring 56,115 triangular element discretizing the metal parts of the antenna and the ground plane and 222,837 tetrahedral elements discretizing dielectric layer (left). 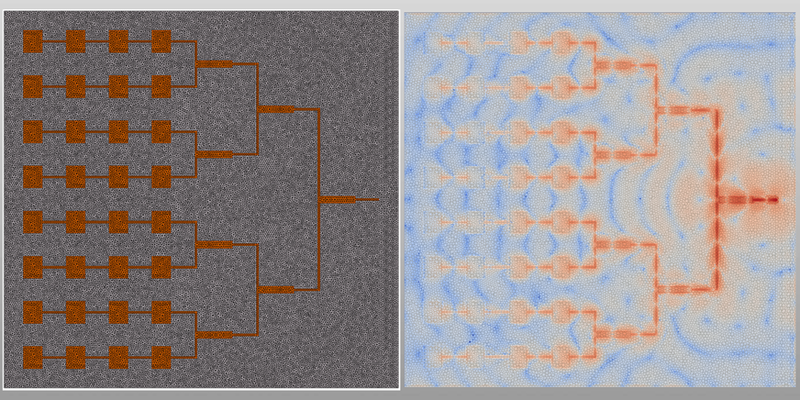 The magnitude of surface surface current distribution on the metal parts of the antenna at 10 GHz (right).